Pope John Paul II appeared via video at the Good Friday procession, sitting at his chapel in the Vatican. The faithful who gathered at the Colosseum for the procession cheered and waved torches as the pope appeared in profile, sitting alone at the chapel watching the ceremony on a television screen under the chapel's altar. 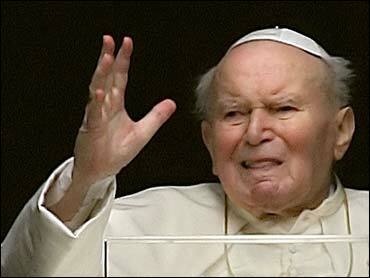 John Paul also sent a message to the crowd that was read by his vicar for Rome, Italian Cardinal Camillo Ruini. In it, John Paul said he was spiritually among those at the Colosseum recalling Christ's last hours. "I also offer my suffering, so that God's design is completed and his word walks among the people," the message said. "I am near all those who in these moments are tested by suffering. I pray for each of them," he said. For the first time in his 26-year pontificate, John Paul was missing the Way of the Cross procession Friday night, which re-enacts Christ's crucifixion amid the haunting ruins of Rome's torch-lit Colosseum. Catholic pilgrims were not discouraged by the absence of the pope. reports CBS News' Sabina Castelfranco. They turned out in the thousands to take part in the Passion of the Lord service in St. Peter's Basilica, with American Cardinal Francis Stafford presiding over the solemn service. The preacher for the papal household, the Rev. Raniero Cantalamessa, delivered the homily and ended with a prayer that the pope recover quickly. "Come back soon, Holy Father," he said. "Easter isn't Easter without you." The 84-year-old pontiff's physical suffering has been evident for years as he battled Parkinson's disease and crippling hip and knee ailments. But it has worsened with the effects of breathing problems that prompted two hospitalizations in a month and added poignancy to the Holy Week commemorations. Meanwhile, the obviously failing health of Pope John Paul II has given new impetus to the Vatican press corps' favorite preoccupation, compiling lists of possible successors, reports CBS News Correspondent Allen Pizzey. John Paul has been absent for the major events of Holy Week, although he has appeared silently at his studio window twice this week and has delivered messages telling the faithful that he is spiritually near them as he recovers. "It's very obvious that the pope is carrying a very heavy cross indeed, and he is giving a marvelous example of patience in the face of suffering, and of long suffering which in itself is a virtue," a top Vatican official, U.S. Archbishop John Foley, told Vatican Radio on Friday. The pope hasn't spoken in public since shortly before he was released from the hospital March 13, and his only commitment during Holy Week is to deliver a blessing on Easter Sunday. John Paul watched Holy Thursday services recalling the Last Supper of Christ on television from his Vatican apartment, and he relinquished another cherished tradition Friday morning when he didn't hear the confessions of faithful in St. Peter's Basilica. The pope used to carry a lightweight wooden cross during the Colosseum procession, which symbolically traces Christ's path to the Crucifixion. He stopped in 2001 because of his difficulty in walking, but he would observe the procession from a chair and offer prayers to the crowds. The pope's vicar for Rome, Italian Cardinal Camillo Ruini, was to take the pope's place carrying the cross at the beginning and end of Friday's procession, while a nun, two Franciscan friars and lay people, including Albanian immigrants and a youth from Sudan, were to carry it at other stages. John Paul's close aide, German Cardinal Joseph Ratzinger, composed this year's meditations to be read aloud during each of the 14 stages of the procession. In them, Ratzinger denounces immorality, including "filth" in the Church, "even among those ... in the priesthood," a possible reference to the widespread sexual scandals among clergy. Although the Vatican has taken pains to describe the ailing pontiff as solidly at the helm of the church, his failure for the first time in his papacy to preside at Holy Week events was a reminder to the world's 1.1 billion Catholics of the limits imposed by his physical problems. "What's important in my mind is to see that the Church functions," Paris Archbishop Andre Vingt-Trois said Friday. "Nothing has stopped" even if the pope takes a less visible role, he said.